The last time these two teams met, the stakes were a lot higher, the AFC Championship game. Overall, the Jags played well enough to win. But they didn’t score when they needed to. Early in the fourth, they took a 10-point lead. But that’s nothing to Tom Brady—and he proved it. This time around the stakes are minimal, but the Jags will want to prove to the world they can run with the big dogs by taking down the biggest. It will not be easy to do so, but they may be in a better position to do so this time. There is a chance they may have to go without running back Leonard Fournette. However, the Patriots allowed Lamar Miller to run for 98 last week; T.J. Yeldon should be able to match that. Blake Bortles is not the dynamic player that Deshaun Watson is. But he can make plays with his legs as well and nearly threw for 300-yards in the AFC Championship game. So, the offense will be able to do its part. Can the defense follow suit? Absolutely. The Patriots will still be without Julian Edelman. Chris Hogan was a non-factor last week. While Phillip Dorsett had an okay day, Cordarrelle Patterson is the only other receiver to make a catch (one for six yards). That means fans will get to see if Jalen Ramsey can indeed handle Rob Gronkowski. It’s always hard to go against the Patriots, but in this case, it appears to be the logical call. 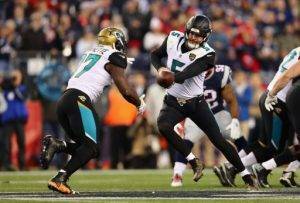 Take the Jaguars to win (+115) over the Patriots (-135). The Patriots will definitely not cover the spread then (-2). The score will probably be a lot like the AFC Championship, so take the under.